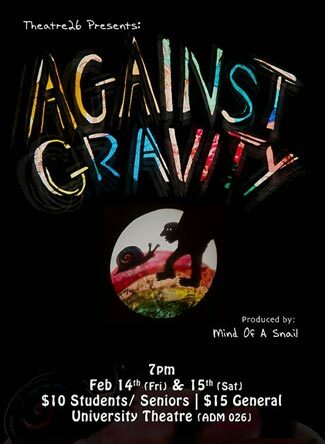 When: Friday, February 14, and Saturday, February 15, 7 p.m.
Part shadow puppet show and part live-musical performance, Mind of a Snail's Against Gravity is a mind­-bending journey through a world filled with surprises. We meet anti-gravity protesters, an advice­-giving snail and several near-death experiences. Theatre 26 and the Faculty of Creative and Critical Studies present Against Gravity at University Theatre, on Friday, February 14, and Saturday, February 15, 7 p.m. Tickets are available at UBC’s Bookstore and at the door -- $10 for students and seniors, others $15. Unlike a traditional shadow puppet show, the two performers of Mind of a Snail, Jessica Gabriel and Chloé Ziner, are both visible throughout the show. Using an overhead projector, Gabriel projects colourful imagery onto a large screen while Ziner creates a live soundtrack with beat­ boxing, guitar loops and help from the audience. In 2013, this 45-minute show played to sold -out houses at the Winnipeg and Vancouver Fringe Festivals, and was a hit at music festivals around BC, Alberta and Manitoba. Plans for 2014 include bringing Against Gravity to Victoria BC’s Winterlab Festival, as well as the Ottawa Fringe. The show is appropriate for adults and children aged seven and older.